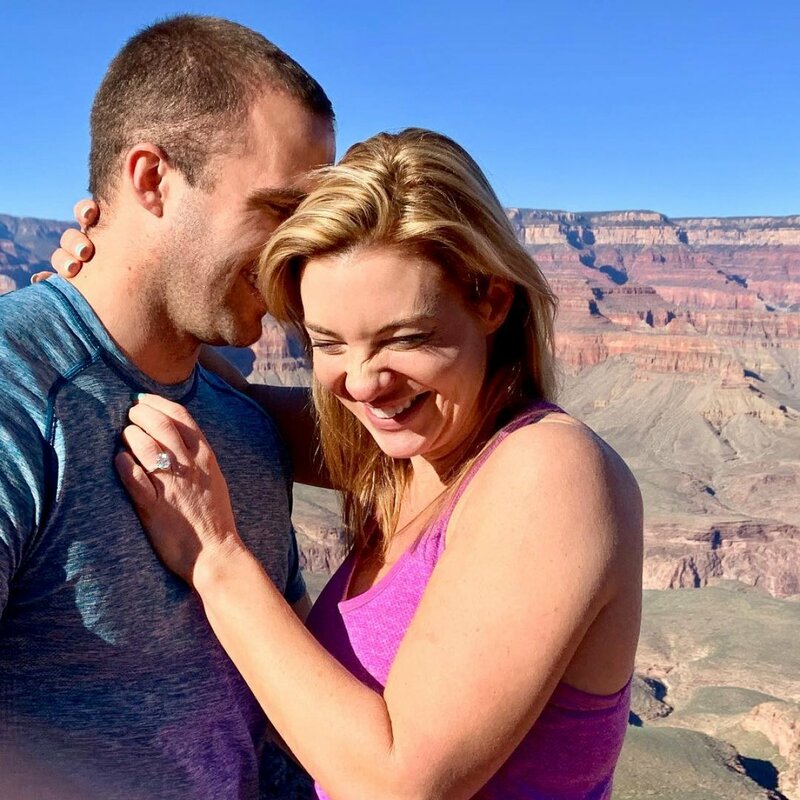 Jonathan, who starred on Season 6 of Married at First Sight on Lifetime, proposed marriage to Jessica on Saturday at the Grand Canyon National Park in Arizona. The couple, however, did not announce their big news until Sunday through separate Instagram posts. "I just love how happy she looks. Oh, and we got engaged at the Grand Canyon yesterday! And now @dr.jessicagriffin is mine foreverrrr #shesmine #nervouswreck @grandcanyonadventures @mpopefinejewelers," Jonathan, 30, captioned a sweet image of Jessica smiling on Sunday. And Jessica shared two photos of the pair riding bikes before she posted an image of the couple kissing in which her oval diamond engagement ring can be seen. "I have always said, you can find love in extraordinary ways -- you just have to follow your heart and be you, nobody other than you, and the right person will find you (if he's persistent enough and eventually hunts you down and won't take no for an answer.) For the first time in my history of knowing him, Jon was at a loss for words and a total adorable mess on his knee. So, of course, I said yes -- just helping a guy out," Jessica, 41, captioned the slideshow. "Today, we celebrated yesterday's Grand Canyon engagement by a sick mountain bike trail ride in Sedona where I decided to faceplant via an endo (where you flip head over feet over your handle bars) and landed on face likely breaking nose, bike landing on top of me and jacked up both legs. Zoom in for the proof. Hey, in my defense, I was a little distracted by this incredible guy. I love you with everything I have. @jon_francetic #lovewins #engaged #shesaidyes." A representative for Jonathan and Jessica told People they are "beyond thrilled" about their engagement and "knew this would be the end result all along" once they began dating last summer. "He proposed after their hike and her sister was there," a friend of the couple also told People of the exciting moment. "He was so nervous! Jessica had no idea what was happening. It was a total surprise." News of Jonathan and Jessica's engagement comes shortly after the magazine reported Jessica is leaving her role as a relationship expert on Married at First Sight after appearing on the Lifetime reality series for three seasons. Jonathan and Jessica met on Season 6 of the show, which began filming in late Summer 2017 and aired on Lifetime in early 2018. The finale aired in April 2018, but Jonathan's Married at First Sight wife, Molly Duff, called it quits on their romance well before "Decision Day." Jonathan and Molly therefore decided to divorce at the end of the eight-week experiment. Jonathan later confirmed he's in a relationship with Jessica in late August 2018, but dating speculation had begun circulating several months prior, fueled by the pair's social-media activity. One Married at First Sight fan, for example, tweeted in July of last year claiming she had just spotted the pair kissing in Sandwich, MA, a Cape Cod town. Jonathan and Jessica had also taken hikes together and even participated in a Spartan race. The friend of the couple insisted to People that Jonathan and Jessica began dating more than five months after his season wrapped. But given Jessica served as a marriage counselor or therapist for Jonathan and Molly on Married at First Sight, both individuals felt the need to defend their romance at first against critics arguing on social media it's "ethically dubious" and "against the rules." One woman, for instance, wrote Jessica and Jon's relationship "speaks poorly on [Jessica]'s profession." While Jonathan addressed the alleged uneducated and unresearched remarks on social media, Jessica shared a May 2018 blog post on her drjessica.com website titled, "Why I Said Yes to Television," that touched on the subject. "At no point should the role I (or others) provide be construed as replacing actual therapy. We are NOT individuals' or couples' therapists on these television shows or in real life," Jessica explained of her dynamic with Married at First Sight and Seven Year Switch cast members. "We do not have a client/therapist or doctor/patient relationship at any point during production or any point, period. Outside companies are hired to conduct the psychological evaluations of cast members." Jessica concluded in her blog post, "My role that I am hired to do as a 'Relationship Expert' is to provide consultation to the cast of a television show and consultation to production on topics that fall within my expertise." Lifetime has yet to comment on Jessica and Jonathan's engagement news. Jessica also served as an expert on the spinoff Married at First Sight: Honeymoon Island.